Rather than wait around for a typeface to be used in protest art, make the typeface itself the protest art. Have I got the rationale about right? @Nate547 Really, it was just a bit of a laugh! Me and a few people I know think the people that hold up these signs, and thought it'd be funny to have a font about it. It took literally an hour to do. HA HA this is the greatest joke font I have ever seen!! Really happy you explained yourself -- was readly to leave a less than polite comment!! LOL Rainbows Rule!!!!! 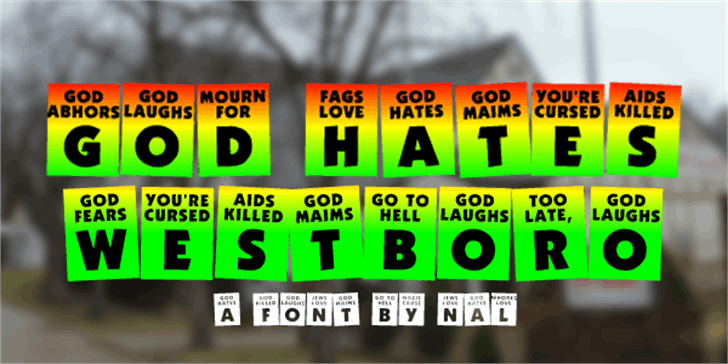 God Hates Westboro™ Trademark of NALGames.